I'm away next week, cycling round Wales and developing legs like a rugby player, so I thought I'd do a quick post now to tide my readers over. Above are screenshots of the Goodreads ratings for my books, taken this morning. 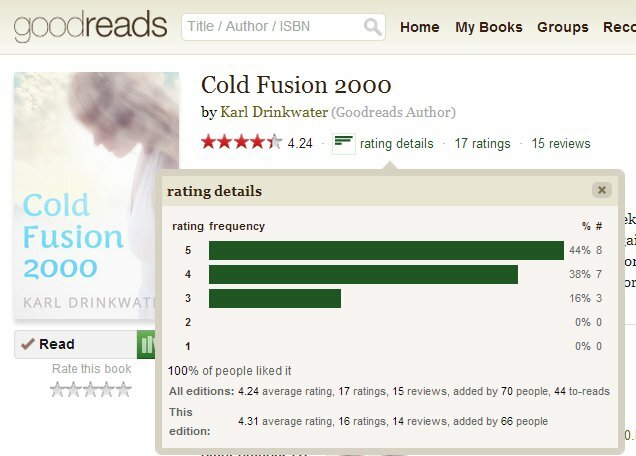 Despite the difference in genre it is gratifying that 5 stars is the most common rating (mode average). CF2K's lowest score is a 3, which still means ‘I liked it’. Turner has a couple of twos, both from people who aren't fans of that type of survival horror book (one said "I like my horror to be more supernatural than slasher otherwise this would have had a higher rating" and the other reviewer told me "I wouldn't call this horror; real horror has to be subtly intelligent with fleshed out characters. This is more suspense with a potty mouth and added gore"). Ha ha, that stung a bit when I first read it, especially because the character who swears uses it mainly to overbalance his opponents and 'turn' a situation around, tying it in to the theme and plot. Though I love the potty mouth accusation, I should get that printed on a T-shirt! I'm more interested in the right book for the right reader (Ranganathan, 1931) than selling copies to everyone, so would always try and dissuade these people from buying or reading the book, since it isn’t good for them or for me. 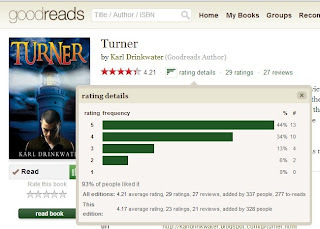 The average scores worked out by Goodreads are 4.24 and 4.21 (out of five) which suggests my writing quality is consistent regardless of what genre I write in. The first video review of my work!